“How Sere Looked for a Pair of Boots” by Alexander Jablokov takes place in a world filled with many different types of aliens who use each other’s body parts, waste products, moltings, and parasites to trade with each other. Hey, everybody’s got something that someone else wants. “Credit to My Nation” by Sandra McDonald is a time travel story featuring a non-binary person in the Carribean. It’s a quest for identity that indicates you need to know the past in order to chart a way to the future. “Written in Mud” by William F. Wu is a humorous piece about farmers dealing with an earthquake that leaves their farm underwater. They have a conversation with a genetically modified catfish and it ends on a literally corny punchline. In “All the Difference” by Leah Cypess, a woman visits a parallel universe to see how different her life would have been if she’d married a different man and is surprised by what she finds out. This was my favorite story in the issue. “Ventiforms” by Sean Monaghan is about a women traveling to a planet that is being turned into a gigantic work of art in order to find her son. “The Gorgon” by Jay O’Connell is a horror story about how the singularity can go awry. “Salting the Mine” by Peter Wood is a humorous story about colonists on a mining planet standing up to a big corporation. “Neom” by Lavie Tidhar is a flash fiction slice of life piece about a maid living in a futuristic middle eastern city. 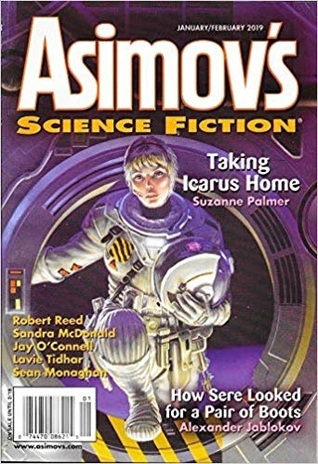 “Taking Icarus Home” by Suzanne Palmer is written in the second person. Unless I missed it, the narrator’s gender is never revealed, although the cover art for this issue indicates the narrator is female. Our narrator rescues a person from an escape pod and ends up being the designated adult in a space station full of people who act like children. We end with “The Esteemed” by Robert Reed which is about a time traveler who visits Earth at different points in history to stop first nuclear war, then global warming, then other large-scale disasters. However, the time traveler isn’t all he seems. I liked this story a lot. The editorial for this issue mentions that it’s unfair stories in free online magazines get more award nominations than stories in print magazines. This is a fair point. Stories in free magazines get read (or listened to in the case of podcasts) by more people and thus get more nominations even though stories in print magazines are just as good. The only way I can think to fix this bias is to only allow people who’ve read everything to make nominations, but I don’t think this is practical. I think we just have to accept the fact that all awards are going to be biased in some way. This is why the Bram Stoker award, for example, isn’t a “best story” award, but rather an award for “superior achievement”. They know there’s no way for everyone to read everything, so they acknowledge that the story that wins the award isn’t necessarily the best story. Juried awards like the Arthur C. Clarke award require their judges to read widely so great stories are less likely to be missed, but having a small panel of judges introduces its own kind of bias towards the judges’ personal tastes. Some day, someone will write a computer algorithm that accurately rates the quality of every story, but until that day comes, we have to acknowledge that there will be lots of great stories which don’t get award nominations due to a lack of visibility.